At the top of Mount Wilson on a dark, quiet night, the sprawling city lights of Los Angeles flicker in the valley below. Across the mountain, several telescope domes are interspersed among the tall pine trees. I gather with a group of astronomers in an office building near the immense dome of the 97-year-old telescope with a mirror 100 inches across. Using a computer, we point six smaller telescopes on the mountain toward an exploding star located 14,800 light years from our sun. It might be hard to believe that we do astronomical research so close to a bustling and bright metropolis, when many telescopes are built on remote mountains farther away from civilization. However, the Southwest provides an ideal environment for observing the stars because of the dry climate and the large number of nights with clear skies. And Mount Wilson’s elevation of 5,700 feet rises above turbulent layers of the atmosphere, providing a less distorted view of the stars. These advantages led George Ellery Hale, a pioneering astrophysicist, and the Carnegie Institution to build an observatory on Mount Wilson in 1904. The comparatively flat surface of Mount Wilson’s summit provided numerous sites for constructing buildings at the observatory. There was also an already established trail, The Mount Wilson Toll Road, that could be used to haul construction materials to the summit on mules and burros. It might be hard to believe that we do astronomical research so close to a bustling and bright metropolis, when many telescopes are built on remote mountains farther away from civilization. Hale worked continuously on building bigger and better telescopes for viewing the surface of the sun and for looking at stars deeper into space. Among the ones he built at Mount Wilson were the 60- and 100-inch telescopes. At the time, they were the world’s largest. I’m often amazed at the historic discoveries made at the place where I work. In 1908, Hale detected the magnetic field around the sun–the first detection of a magnetic field outside the Earth. In the late 1920s, Albert A. Michelson conducted experiments to determine the speed of light by projecting a light beam from Mount Wilson to Lookout Mountain about 22 miles away and timing its return. In 1929, Edwin Hubble used the 100-inch telescope to correlate the distances to galaxies with the speed that they are moving away from us, confirming the expansion of the universe. Southern California has grown up around Mount Wilson since Hale’s time–one of the observatory’s first astronomers described parts of Pasadena as “open country with vineyards and orange groves intersected by rambling dirt roads”–which means we get more light pollution from surrounding cities. People are often surprised that we run a world-class observatory overlooking the Los Angeles area, but our current work focuses on relatively bright stars, so light pollution from the surrounding cities doesn’t interfere with our research. 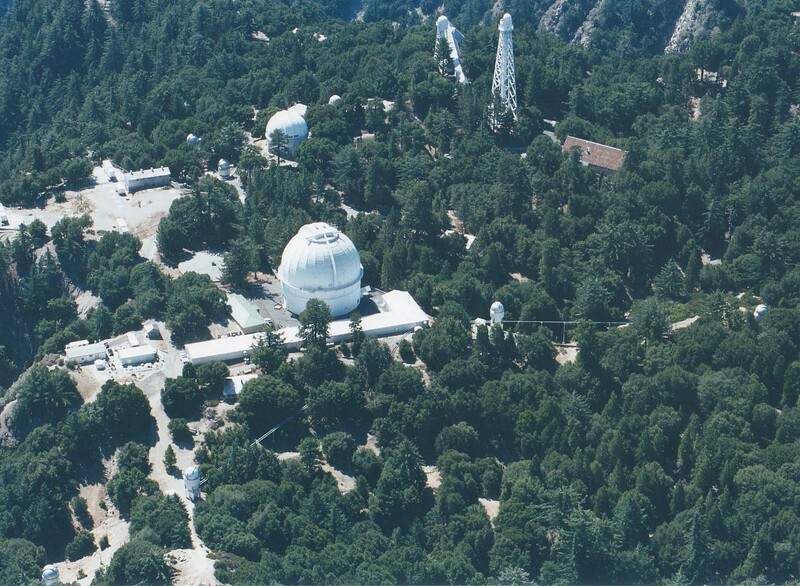 I work at the Center for High Angular Resolution Astronomy (CHARA) operated by Georgia State University, which chose Mount Wilson for many of the same reasons Hale did years ago and because of the advantages of building on top of existing infrastructure. We link together six 1-meter telescopes on the mountain to simulate a huge telescope with a diameter of more than 300 meters. The larger the diameter of a telescope’s mirror, the higher resolution it has, making it possible to see finer and finer details. Instead of building a single mirror as large as an entire mountaintop, astronomers build arrays of smaller telescopes that can be linked together to produce a resolution equivalent to that of a much larger telescope. The starlight collected by each of the six telescopes in the array follows a complex path across the mountaintop. We send the light from each telescope through vacuum pipes into a large optics laboratory. Inside the laboratory, the starlight from the telescopes is combined together. The array doesn’t give us direct images of stars like a traditional telescope; instead we record the interference pattern produced when combining the starlight together. The interference pattern encodes information about the size and shape of the star. We have high enough resolution that astronomers can image the surfaces of stars as far away as almost 10,000 light-years, about a tenth of the way across our Milky Way Galaxy. I use the Array to study gaseous disks around massive, rapidly rotating stars. A nova occurs when a thin layer of hydrogen builds up on the surface of a white dwarf, a compact, stellar remnant from a low-mass star like the sun. The hydrogen gas falls onto the white dwarf from a nearby companion star. As the pressure on the surface of the white dwarf builds, it triggers a thermonuclear reaction that blows away the outer layers of gas and makes the star significantly brighter than normal. After we heard about the nova through an electronic notification system that sends out notices on transient astronomical events, my colleagues and I decided to see if we could measure its size using the CHARA Array. We obtained our first observations within 24 hours of the explosion. As a result, we were able to produce the first images of a nova during the early fireball stage and see how the structure changed as the ejected material expanded and cooled on a night-by-night basis. Images of the expanding fireball of Nova Delphinus 2013 from three nights during the first week after the explosion. The white scale bar is 2.3 astronomical units in length (2.3 times the distance between the Earth and sun). Early astronomers studied novae to help us understand the origin of these new, bright stars that would sometimes appear in the sky. With the high resolution achieved with the array, we get a new window into understanding how these explosions happen. Being an astronomer in the 21st century isn’t quite as rugged as the early days. Rather than shivering in a cold dome at the eyepiece of the telescope, we now observe in well-lit, heated rooms and use computers to control the telescope out at the dome remotely. And instead of hiking up the Mount Wilson Toll Road on foot or riding on the back of a balky burro, I take the pleasant 20-mile drive along the Angeles Crest Highway through the chaparral-covered slopes of the San Gabriel Mountains. But I still feel that sense of quiet escape on Mount Wilson as I work beneath the blue sky, surrounded by tall trees, telescope domes, and mountain peaks. Gail Schaefer is a research scientist at the CHARA Array of Georgia State University, located at the Mount Wilson Observatory. 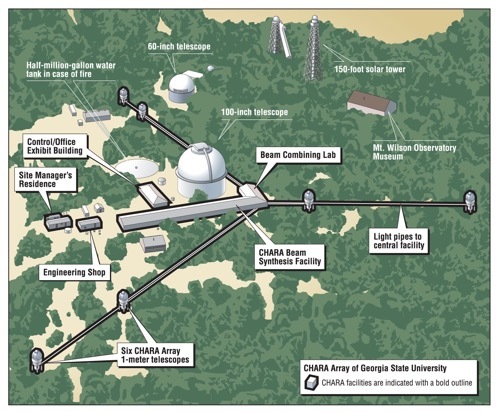 Funding for the CHARA Array comes from the College of Arts and Sciences at Georgia State University and the National Science Foundation. Operational since 2005, the facility was constructed with support from the National Science Foundation, GSU, the W. M. Keck Foundation, and the David and Lucile Packard Foundation. *Lead photo courtesy of Eric Simison/Sea West Enterprises. Interior Photo Courtesy of Gail Schaefer.